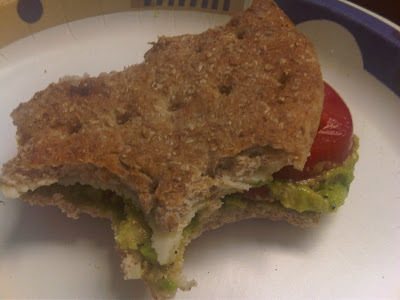 I have discovered my new favorite lunch...an avocado, tomato, and cheese sandwich. I discovered this yummy concoction on a Friday when I could not eat meat (Lent) and that was all that was in my fridge. IT IS AWESOME. The avocado is creamy, the tomatoes are tangy, and cheese makes everything better. Plus it is very healthy. Avocados provide you with healthy fat that has been proven to lower cholesterol and blood pressure. Cheese gives you calcium, and tomatoes are full of lycopene which fights numerous diseases. Plus all three of these ingredients are great for your skin and lessen the signs of aging. Who doesn't want to get rid of wrinkles while they eat? Talk about a Power Lunch!!! I am sorry the sandwich in the picture is half eaten. It is just so good I couldn't wait!